A few days ago I was tagged by the lovely Ella from Every Little Thing 07 to do the Blush Addict Tag. Now, I'm not the biggest blush fan so the answers are going to be really easy. This tag seems interesting as I get to evaluate what I already own and re-discover some old favorites. 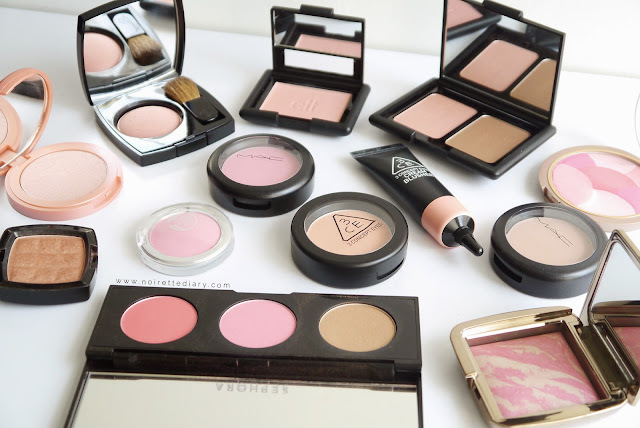 The super subtle pastel pink or really pale shades, I always wear a bit of contour so a soft color for blush will make me look more natural. My go-to for the last 2 months has been the Tarte Tartelette blush in Celebrate. Pressed is the best way to go. Easy to carry around, to apply, and to store. It's a little hard because I tend to go for a matte finish and then decide whether to add highlighter or not. Probably the most shimmery that I can go is Benefit's BellaBamba. 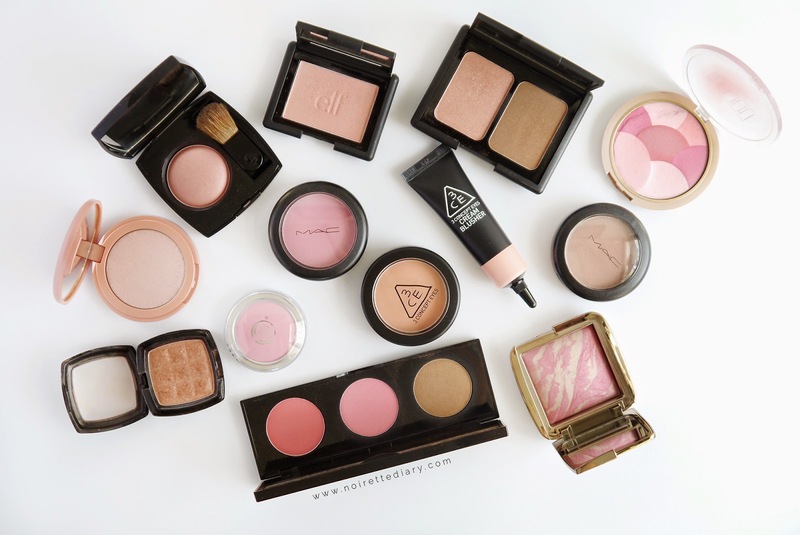 If I want to achieve a more girly look, I'll go with MAC Stay Pretty. It looks really natural on me and I love that it's a longwear formula. If I'm going to wear my makeup for a long time I'll definitely choose a matte blush, so this one works perfectly for those days. I didn't own one single cream blush until a couple of days ago when I got a few products from 3 Concept Eyes. I ordered one of their cream blushes (Baby Peach) and I have to say that I really like it. It has a matte finish but still a little glow. I can't say more about this question because this is the only cream blush that I've ever tried. Back when I started my blog I was obsessed with Terracota from NYX. Even though it's quite shimmery I love that it has a really warm tone. It's an old favorite that I will always for a glowy bronzy cheek. I just got one of the Hourglass Ambient Lighting Blushes in Luminous Flush and it's starting to become one of my favorites. The color is really pigmented so a little goes a long way. Definitely looking forward to get more of these as well as the bronzers. As I said above, I'm more into the subtle shades but in my 3 Concept Eyes haul I got a pressed blush in the color Maybe. It's a really bright orangey toned blush that doesn't look very natural on me. However, it bring a lot of light to my face, the kind of brightness you'd like without shimmer. I'm safe on this one because it was the ELF blush in Twinkle Pink and it didn't damage my budget. I had seen a couple of swatches online and it seemed like a decent pinky tone/gold shimmer type of blush. After swatching it at home all I could see was gold glitter and hardly some pink. From my collection I love the Tarte packaging. It's small and thin enough to fit anywhere. I love that it as a good mirror and that the packaging matches the color in the pan so it's easy to know what you have laying around. Nars is top of my list even though I'm not sure which blush I want, I'm just starting to add this brand to my collection and I feel like a blush is a must. Again, more of the Hourglass Ambient Lighting Blushes, it took me too long to decide which one I was going to take home in my last visit to Sephora so I know that I have to go back for a couple more. This might change in some time but since I got the Benefit Box O' Blushes my favorite one has been Dandelion. It just goes with everything and never fails to look perfect. I'm pretty sure I'm going to have to get the full size version before I hit pan on this one! If you want to do this tag please let me know in the comments, I'd love to see your answers!